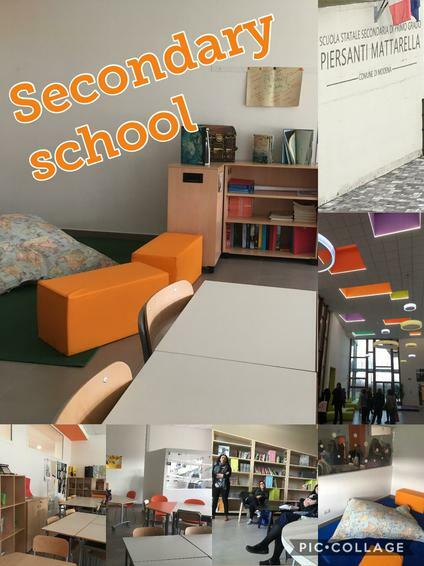 In Italy pupils aged 10-14 years old attend the equivalent of our secondary school. The headmaster is also head of 5 other schools (with pupils aged from 0 to 14 years). Piersanti Mattarella is a purpose-built building. They have adopted the Anglo-Saxon style of teaching - where teachers stay in a classroom and focus on a specific subject, whilst the pupils move around. The building was bright and airy with a very simple style of decoration. There was a central area with high ceilings and coloured recesses that had roof lights in them. The hanging hoop style lights regularly changed colour. Pupils used this space during breaks. The library has only recently been developed and will be open to the local community on Saturday mornings very soon. Each classroom has a carpet area with a large floor cushion. There were very few display boards in the classrooms. 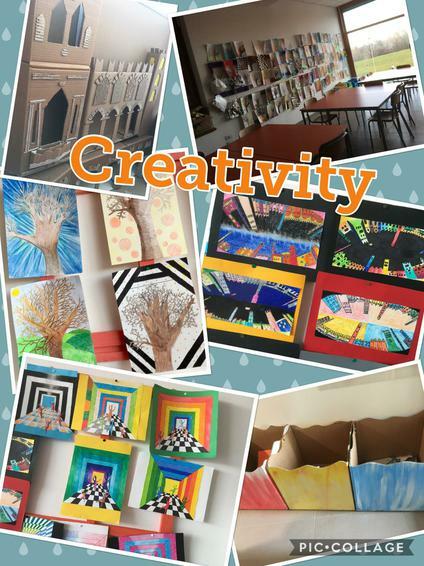 These are images from the school's art studio. They were seen as being a very creative school. We were invited to visit one of the headteacher's primary schools. This school taught 6-10 year olds. They were trialing having specific teachers to deliver art, IT and languages. It had a robotic lab with a 3D printer, We-Do construction and Beebots. Fico is an inside food court. It is the size of 14 football pitches and celebrates the area being the food capital of Italy. It is so big you can borrow three-wheeler bikes to ride around the centre. The place is full of stalls that demonstrate how parmesan cheese, serano ham, chocolates, almonds, honey, pizza, etc are made. We were given lots of scrumptious foods to try. Two of my favourites were the very expensive balsamic vinegar and delicious chocolates. There was an indoor beach, a playground and a set of high stools with pedals, that let you cycle whilst eating tasty treats from around Italy. Bob really like the colourful almonds that were made into flowers. These were called confetti and they were beautiful.